Keep in touch with your customers from just 1.74p per message. If you are looking for the most efficient and effective way to communicate with your customers or audience then you are in the right place. Voodoo SMS specialises in bulk SMS messaging, which is a fantastic channel of communication. SMS is by far the quickest and the most productive way to communicate. Text message marketing is increasing in popularity as a far more effective communication tool than email marketing because many emails are deleted before they are even read - and that's on the basis that you can even get them into the inbox in the first place. SecurEnvoy carried out a survey in which 66% of people in the UK suffer from nomophobia, which is a fear of being without a mobile phone. This shows that SMS text marketing will be effective and will work, if conducted properly. 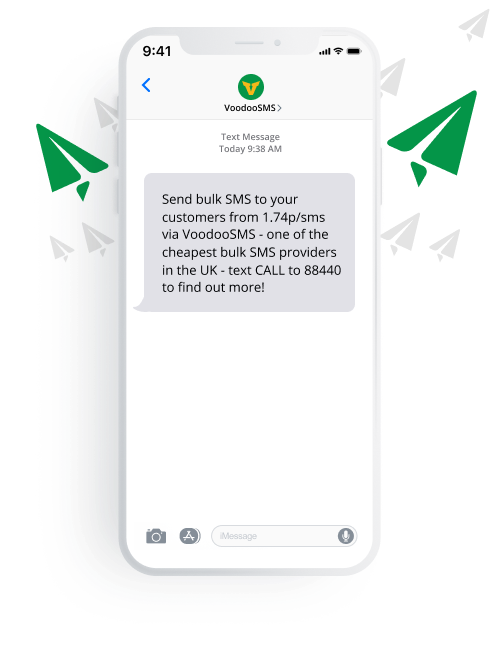 As our name appropriately suggests, we have blended our magical brain power with market insights and the latest technologies to create the most user-friendly system for sending bulk text messages. Dale Archer, Head of Marketing. "The Voodoo SMS platform is really simple to use. Within minutes we were ready to send out our first campaign"
On average, we are 39% cheaper than our competitors, but this does not mean that the quality of our service is compromised. We believe that our pricing is impossible to beat, but if you think you've found better, we would welcome the challenge! Voodoo SMS is very easy to use. There is a simple reason for this: it was designed by end users rather than technical boffins. This means our customers can be in control of their own broadcasts without requiring a PhD in geekology. Your account manager will walk you through your first broadcast so you are aware of all the fantastic features. We don't tie you into any contracts! We are so sure you’ll love Voodoo SMS that we don’t need to trap you in a web of legal jargon to keep you. If you ever want to leave us you can do so, hassle free! You will only ever pay for what you use. Voodoo SMS provides our customers with several KPIs to measure the success of each sent message. Analysis of this invaluable real time information is essential for designing future campaigns, and making them even more effective. What truly sets Voodoo SMS apart from our competitors is our unparalleled focus on customer service. We offer FULL UK support, 24 hours a day, 7 days a week. Built for developers by developers. A few lines of code and it is done. And since our ever-evolving API has been designed by our in-house team of talented developers, you can always speak to one of them to give you a helping hand.